Caleigh just finished an almost month long trial with the Eco2 by Prentke Romich. She did really well with it. 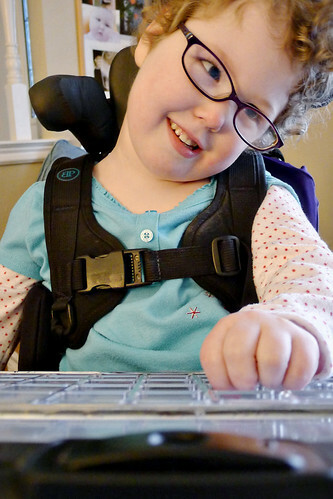 We tried the Eyegaze technology for a day or two but the device could never pick up her gaze. We then received a 45 square key-guard for it, and Caleigh really seemed to take off. So we stuck with the direct selection method. Trial after trial of device after device, and we have now decided to purchase the Eco2 for Caleigh. The language system has the most potential for her future. 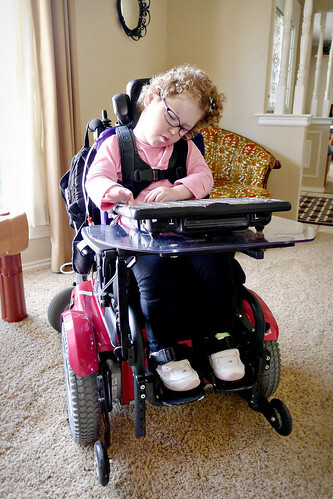 With the proper mount and positioning she is the most independent with this device. It will not take the place of Caleigh's iPad to begin with, but after time and practice it could very well do just that. I definitely think that these big dedicated devices are for older children and adults that are generally in their chairs for longer time periods. It just makes more sense. Until Caleigh is in a chair and communicating for longer stretches, the iPad is definitely more logical for us. Here's a quick video of Caleigh using the device. Here we have her selection at 45 squares one hit. She does tell me "please" after I turn off the camera. I added this photo mainly to show Caleigh's hair in a bun on the top of her head. She likes to match her mommy and asks for a pony tail a lot when we are hanging out at home. It's getting pretty long. When her hair is wet and brushed out straight, it will touch her shoulders, but it quickly curls right up. 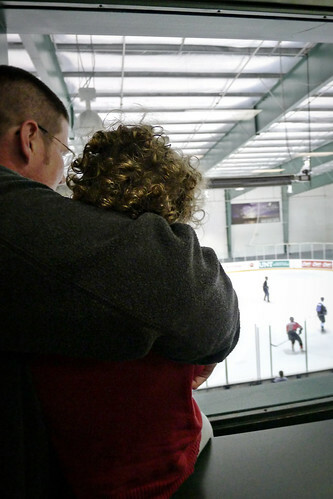 Last weekend, Caleigh got to stay up past her bedtime to go to her first hockey game. It was a Guns & Hoses benefit game. The firefighters won the game, which hasn't happened in several years. Caleigh must have been good luck. She loved the game and was all smiles while her Daddy was explaining it to her. Now on to Orthopedics. About two weeks ago Caleigh was irritable, not sleeping well and generally whinny. I finally figured out that she was having growing pains about two days into the ordeal by pulling up the body parts folder on the iPad. She told us legs and ankles hurt. I massaged, stretched and massaged her some more. 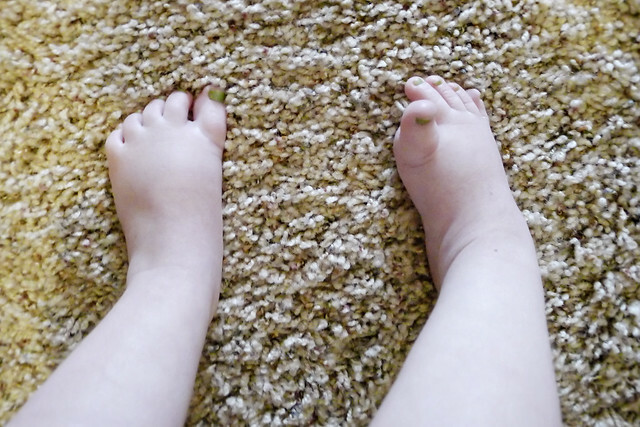 By the time she was done with her little spurt she was skinnier, a tad taller and her right foot looked like this. 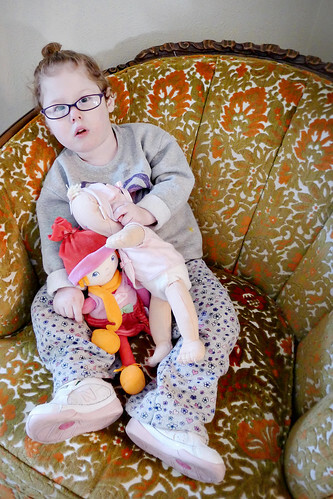 On Wednesday, Caleigh had her 6 month follow-up with Orthopedics. They took x-rays and everything with Caleigh's hips looked exactly the same. No change there. That's the good news. They looked at the muscle tone and watched her take steps in the office. 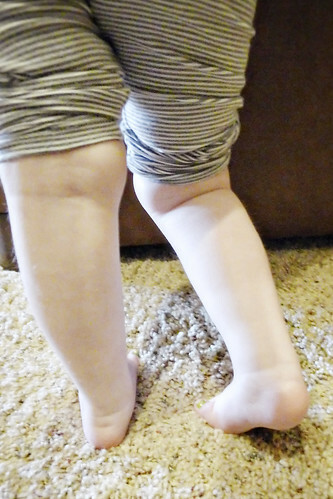 After sizing everything up, they think her quads are probably tight, and of course, her achilles tendon in her ankle. The achilles is causing the knee hyper-extension and the tight quad is probably causing the right leg to turn in. Fun Fun Muscle Stuff. 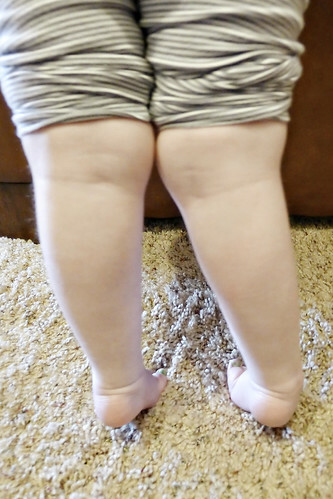 The above photos show what the two main positions of Caleigh's legs are without her AFOs. The recommendation is a cautious botox treatment. 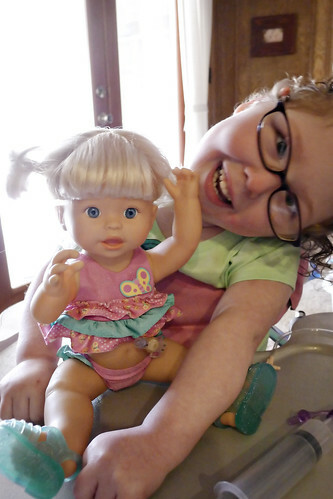 Cautious because Caleigh's dystonia causes brief spastic muscle tightness, and not continuous contractions. She uses the tone that comes with her dystonia to do what she is able to do. This includes standing up after using the potty, practicing standing transfers, using her walker and driving her powerchair. She uses what the Lord gave her. So paralyzing those muscles is a tricky decision for us, but something we need to consider. There's always something to think about next.